Home / Australia / Glenroy library gets its own Nepali books corner after Coburg library. Glenroy library gets its own Nepali books corner after Coburg library. 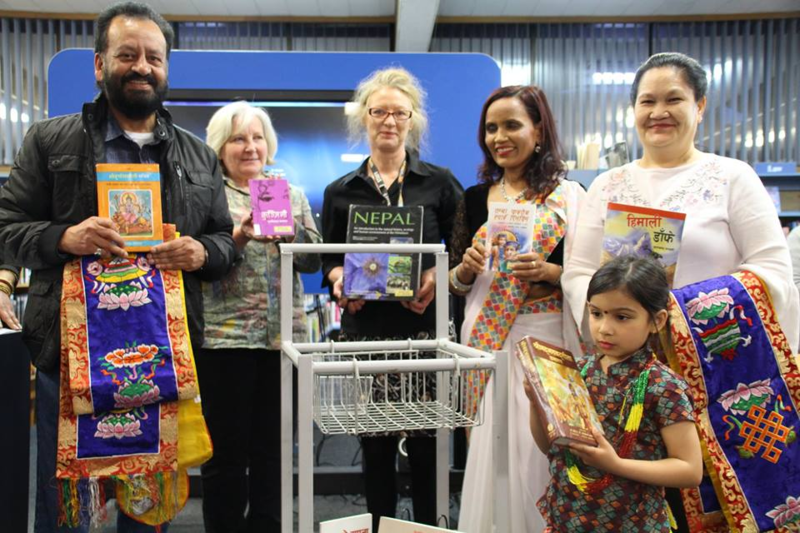 (Nepalese Voice)- A Nepali books section at Glenroy Library was established with the official handover of Nepalese literary books by Didi Bahini Samaj Victoria (DBSV) on Tuesday, 25 September 2018. The Nepali literature dedicated section at Glenroy Library comes not long after the establishment of a Nepalese section at Coburg Library. Chief Guest, Hon. Consul General of Nepal to Victoria, Chandra Yonzon, along with esteemed guests, Nepalese Association of Victoria (NAV) Adviser, Bom Yonzon, Rotary Club of Essendon President, Jenny Foster, and Non-Resident Nepalese Association (NRNA) Australia representatives joined over 100 Nepalese and Bhutanese community members at the inauguration. The book section was inaugurated by librarian Barbara Johnson, president of DBSV Jamuna Parajuli, advisor Laxmi Yonzon, and local community members Madan Dhungel and Swrikriti Sharma. DBSV President, Jamuna Parajuli, addressed attendees saying that their long-held dream of having a Nepalese section at Glenroy Library had now come true. The new section will provide a great opportunity not only for the Nepalese community, but also wider communities in Victoria. Parajuli said that she looks forward to providing more reading materials to the library. Nepalese duo writer, Prabati Pahari and Sushil Chalise, were also delighted to hand over their own works to the library. The books were officially inaugurated by Laxmi Yonzon and community leader, Madan Dhungel. DBSV Member, Sanjana Shrestha, shared her experience on the partnership program, and her initiative to link DBSV and Read Nepal to establish the project in Glenroy Library. In his speech, Consul General Yonzon said that he enjoys attending DBSV programs which always manage to take the community to the next level. Consul General Yonzon thanked DBSV for their tireless work in establishing the Nepalese sections at Glenroy. Furthermore, he also addressed those community members who helped to establish Nepali book section at Coburg library as well. He said that it is great having two Nepali sections in Moreland Council, and that he looks forward to having more Nepalese sections in other suburbs and councils in the future. The program ended on a delightful note with cultural dances and light refreshments. Previous ANSCS celebrates its 4th Anuual Senior Father’s Day.